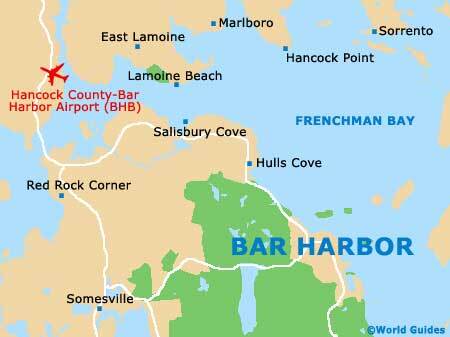 The famous summer colony of Bar Harbor, Maine, lies on Mount Desert Island, in the Down East region of the state. Home to just over 5,000 permanent residents, the town is composed of large segments of the Arcadia National Park, including Cadillac Mountain and the village of Salisbury Cove. 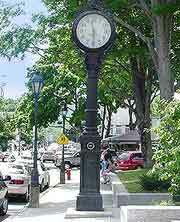 Early Bar Harbor history saw the area settled by the Wabanaki Indians. The town was home to these nomadic peoples for hundreds of years, with fishing, shellfish gathering, hunting and berry picking supporting small communities. French explorer Samuel de Champlain was the first westerner to visit the island when his ship ran aground in 1604. Local Indians helped with the repairs and his experience was written into the ship's log. In 1763, the first permanent settlers, John Thomas and Israel Higgins, arrived on the island and the tiny colony was named Eden in 1796, after British statesman Sir Richard Eden. Agriculture was a mainstay in Bar Harbor's early history, as the soil was rich and fertile, and fishing, lumber and shipbuilding became well established. By the 1840s, the island's natural beauty had attracted an artists' community including Thomas Cole, William Hart, Fitz Henry Lane and Frederic Edwin Church, all of whom were well-known painters of the Hudson River School or Luminism movement. Sportsmen, journalists and those looking for pastoral delights soon followed, with the first hotel, Agamont House, opened in 1855. 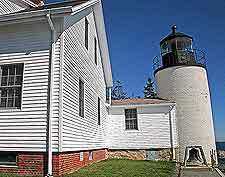 The first summer estate, Birch Point, was built in 1868, marking a turning point in the history of Bar Harbor as a recreational destination. By the late 19th century, considered part of the Gilded Age, over 30 hotels were established in Bar Harbor to cater to tourists, who arrived in droves by ferry and train. The resort soon became a hub for the wealthy and famous, who competed with each other for the best estates and gardens. The good life was in full swing, with yachting, garden parties, carriage rides, horse racing and golf enjoyed by the elite. 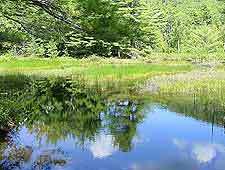 By the 1920s, Eden, having been renamed Bar Harbor in 1918, was synonymous with wealth and a high social position, and everyone who was anyone in American high society owned a summer estate on the island. However, in the autumn of 1947, during a severe drought, sparks ignited a wildfire that spread across the parched island for almost a fortnight and this fire was not actually fully extinguished for one month. Over 25 percent of the island's surface was consumed by the flames during this terrible event in Bar Harbor history, including some 67 palatial estates along Millionaires' Row, five historic hotels and 170 lesser homes. Nowadays, the scars of the disaster are few and every year more than three million tourists flock to the island, mostly in summer for the outdoor activities and whale-watching opportunities.